What are the best RV heaters in 2019? If you lack the time to do some proper research, but you’re desperately in need for an RV heater, and you don’t know where to get one, we’re here to help you! We’ve read dozens of RV heater reviews and are ready to present a well-documented buying guide to help you make a decision. Follow our tips if you want to learn how to pick out the best RV heater you could possibly get. Our findings show that the first product you should take into consideration is the Mr. Heater F274830 Big Buddy, for it has some extremely useful features. One of them is its power, which goes up to 18000 BTU and could heat up spaces up to 300 square feet. Also, this item is approved for both indoor and outdoor use, and it burns clean, without producing pollution. If this model happens to be unavailable, we recommend you check out the Mr. Heater F232000 Buddy as a great second choice. This heater works by being connected to a propane tank, and it generates a heating power between 4000 and 18000 BTU, which can be enough for a room of approximately 300 square feet. An adjustment knob with three progressive levels is added to the design to allow you to control the level of the temperature. If you were planning on using this heater at altitudes higher than 7000 feet, you should know it’s going to shut off because of the low oxygen levels. 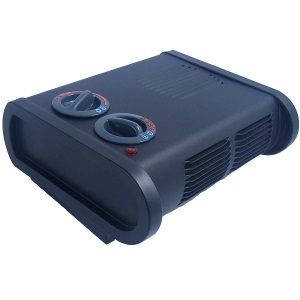 Try this model if you’re looking for a reliable heater that will work in every enclosed space. Very similar to the other Mr. Heater alternative we’ve reviewed, this item is slightly more affordable, and it resembles the same functions. For example, it can be used both indoors and outdoors, and it comes with an adjustment knob to help you control the temperature. In order to be picked up safely, it features a foldable handle. A large gas tank is required if you want to substitute central heating with this item, and it might be dangerous to keep that inside the home. This option from Mr. Heater embodies all the reliable features for a more affordable price. The low profile design of this product makes it suitable for indoor use since it’s difficult to accidentally hurt oneself while using it. It has two adjustment knobs, one to adjust the power and another for the temperature so that you get an optimal balance between resource consumption and level of heat generated. Being an electric heater, the obvious downside to this is you can’t use it in case of a power outage. So it might not be as helpful as it’s advertised. The Caframo heater is a good idea in case you want to heat an indoor space temporarily. 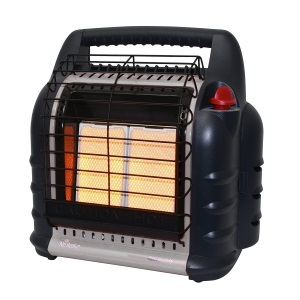 If you want to know how to compare the various alternatives available and choose the best RV heater for sale, you need to have a few basic rule to guide yourself after. Luckily for you, we’ve put together this buying guide to have a look at the features you’re next heater should have in order to be worthy of your attention. To know whether an RV heater can be used both indoors and outdoors and if it can heat up larger spaces or if it’s only useful for a small room or a motorhome, you need to check and see how it can be powered. There are generally two types of heaters, those that run on electricity and thus that can be connected to a propane tank. It’ s easy to guess which one is more suitable for which environment. The products that run on electricity can only be used outside if you have a source nearby, while the ones the run on gas will not be of much help if you plan to use them at very high altitudes. In the end, it all comes down to your original purpose. If you want to be able to properly control the output of your heating device, you need to make sure that it is equipped with easy-to-use and visible adjustment knobs. Many designs place the adjustment knobs right on top of the heater, also painting them in bright colors to make them visible. While this is a nice feature, what really matters is the options you have to choose from. It’s hard to incorporate everything on just one scale, so we recommend you to buy an item that features more than one knob, if possible. This way, you will be able to determine not only the temperature but also the power at which your heater operates. We feel that there’s a need to bring up this subject considering the fact that many heating devices available for sale are only compatible with other accessories produced by the same brand. If you feel like this is a problem, do not hesitate to look for an alternative that can be paired with any type of additional accessory. In order to find a good RV heater, besides following a few tips to be able to compare between the many options offered to you, you need to know your priorities and act accordingly. We’ve taken it upon ourselves to review a few of our favorite products below to give you a starting point. This model from Mr. Heater must be connected to a propane tank in order to function, and it can heat up a room of up to 300 square feet. The heating power can vary between 4000 and 18000 BTU, and as a result, this design is 100% efficient. However, if you intend to use it at altitudes slightly above 7000 feet, the heater will shut off due to lack of oxygen. As a matter of fact, Big Buddy’s auto shut-off function can also be activated if the pilot light goes out, not only if it detects low oxygen levels. 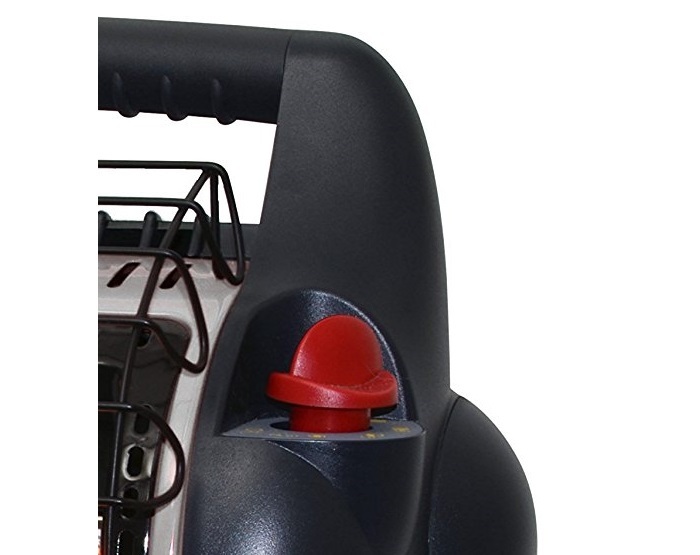 In order to allow you to control the temperature, this model features an adjustment knob on the top, with three slots for low, medium and high heat. 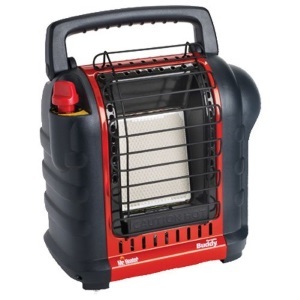 Although this is one of the best options for heating enclosed spaces like holiday cabins and so on, we must warn you not to use any unauthorized accessories if you intend to buy this product because it may cause damage. This model is a slightly cheaper alternative also offered by Mr. Heater that is suitable for smaller spaces, up to 225 square feet, and only gives off between 4000 and 9000 BTU. Much like the other product from this brand that we’ve also showcased in our selection, this version is approved for both indoor and outdoor use and burn clean, without producing polluting gases. This item’s auto shutoff is triggered if the pilot light goes out or if it detects low oxygen levels, which means it may not be a good idea to use it at altitudes over 7000 feet. In order to be easier to handle, the design includes a fold-down handle. Also, to be able to adjust the heat given off by this device you need to change the temperature using the swivel-out regulator placed on the top. Although this product is protected by warranty, it becomes unavailable if you pair it with unauthorized accessories. This rather affordable model from Caframo Limited is protected by a 5-year warranty and provides reasonable quality for its price. Featuring a low-profile design, as opposed to the other products we’ve included in our selection, this product is very easy to use since it features two adjustment knobs on the front and a variety of options to choose from. One of the knobs is designed to adjust the power of the device while the other features a temperature scale so that you can more accurately choose the way you want to heat the space. It also contains an anti-freezing setting, so it’s perfectly equipped to function even in extreme circumstances. The outer layer is coated with a durable finish, guaranteeing the longevity of this design. It can be plugged in using a standard two-prong polarized plug, and it runs at 120V, meaning that it can be used in almost any indoor space, but it’s not fit for outdoor use unless you have an electricity source nearby, which makes this a good heater for a motorhome.